Combining safety, security and convenience, The Safety Scabbard™ is the leading gun containment system on the hunting market today. Literally leaving all other competing gun racks and cases in the dust, The SafeTraveler™ patented locking mechanism and custom mounts assure that your gun will be securely fastened to your vehicle even during the most rigorous of rides. Its unique design accommodates all styles of rifle or shotgun: over & under, side-by-side, pump action, auto action or scope mounted rifle. 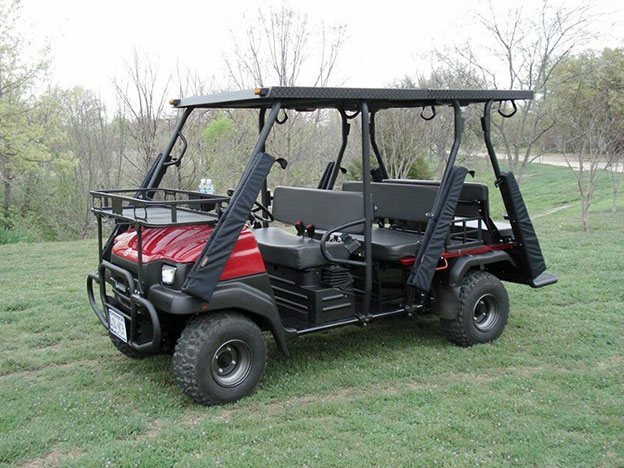 The SafeTraveler™ was engineered to be both simple and efficient, making it easy to secure and retrieve your gun from your ATV, golf cart or other hunting vehicle. The SafeTraveler™ is easy to use and our accessory kits offer a variety of applications. Just click below to view our instructional videos and you will be on your way to safer, more secure, and convenient hunting experiences.